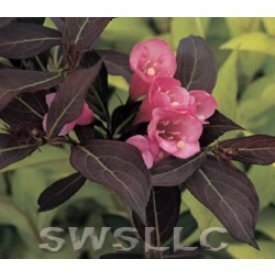 The Weigela Wine and Roses, 'Weigela 'Wine and Roses', a Proven Winners selection, is a beautiful tall Weigelia with rich dark burgundy foliage. The dark burgundy foliage contrasts nicely with the pink flowers in the spring. This plant will produce a lot of flowers in the spring and will rebloom throughout the summer. Wine and Roses is very dramatic when planted in mass. This fast growing plant will add season long color to your garden Each bid is for one plant. The picture of the flat is a example of what the plants currently look like and will arrive like apon shipping. Any questions feel free to ask us. Due to Agriculture regulations of plant contain soil, All Plants shipped to HI and Puerto Rico, All stock shipped to these destinations must be shipped bare root.